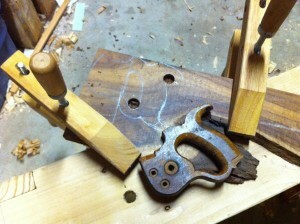 When I was working down in the garage last week I noticed that my Disston backsaw handle had cracked even further. I picked it up at a antique store a while back, rusty and beaten down (but not out). I had revived the blade, and it has become a staple in the shop for mid level sawing. Tonight I made a new handle for this saw, my bench top workhorse of a saw. In three hours no less! Christopher Schwarz might say Medium in the Coarse Medium and Fine scale, at least I think that’s what it implies as I’ve not picked up the book yet. It’s a concept I get though once I thought about, grouping tools into ones that handle the coarse, the medium and the fine. Anyway, I got a little time tonight to work in the shop and rather than work on the project I had started last week, I decided to pick up a new project. When I get time, I tend to go with the flow, almost Zenlike if you will, although I think Zen might require less swearing and dropped tools. I picked up the backsaw to move it out of my way, and noticed the handle split again. I picked up a random piece of scrap wood I had salvaged from the 2nd Use store, Walnut I think, and traced my old handle on the board. 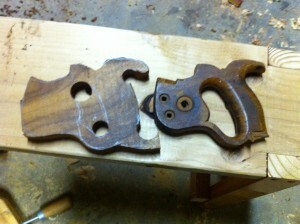 I sketched the busted off bottom horn by putting on of my Disston handsaws down, and making it fit. Then I tweaked it a little to make the whole think look right. To make the cut outs and make the inner curves I tried a trick I read on a blog somewhere, and used a number 12 and number 16 auger bit to make the really tight curves of the inner handle and under the horns in the back of the handle. I cranked these up in my brace and bit (is it just a brace?) and did one side till the lead screw poked out the other side, and then flipped it over to get a clean hole with no tear out. 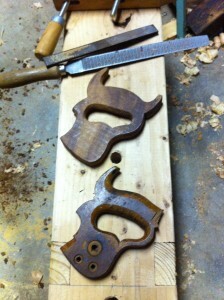 Then I cut out whole thing using a coping saw mostly with some straight cuts with my crosscut or dovetail saw. (Coarse and Fine, but really it was whatever worked and was handy.) I tried to stay as close to my pencil lines as I could. The auger holes were a HUGE help and really made this much easier. 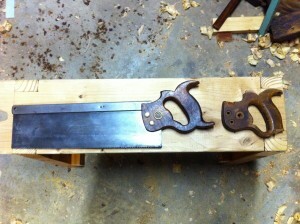 I highly recommend this approach when making a saw handle like this. Then it was time for lots of file work. This is what took most of the three hours, mostly with a coarse toothed rasp that had a round and a flat side. I kept referring back to the original handle as to where to shape, and lots of test fitting to my hand and adjusting and filing, etc. I broke a pretty fair sweat on this part, but it was fun to have it becomes slowly become more and more comfortable in my hand. I tuned it up with a finer rasp, and finally some 120 grit sand paper to make it smooth. I didn’t go any smoother, because it was getting late, and it felt pretty good in my hand already. Once it felt right, I was really on a groove and didn’t take any more pictures of the rest of the build. I’ll do my best to describe the next steps. To make the slot for the blade I free-handed the line down the middle carefully. Checking it against the old handle a lit. Then I started the cut with my dovetail saw very slowly. Once I had a good line going, I grabbed the backsaw blade itself, and used it carefully with out the handle to make the rest of the cut. I took my time, one cut at a stroke, and checked my line frequently. It took a while, but this had to be right. Then I took my smallest chisel, and cut out the notch at the top for the backsaw spine. This I also took very carefully, and carved it as best I could. Turns out I was a little too cautious here, as I had to go back to the notch twice to get the blade to fit with the screws lined up. Once I had it close, I needed to drill the holes for the screws, and I had to use a powered tool (my beloved cordless drill) since I did not have the right sized auger bits. This is the only non human powered tool used in this whole build. I drilled the holes by clamping the old and new handle together, and drilling through the old holes as a guide. Then I fit the screws to the handle with a variety of twist drill bit sizes. This is where I had to tweak the handle quite a bit, to get this to all line up and fit right. The slot for the spine was too shallow, so it had to be adjusted. Once it all lined up, I screwed it together (it was getting late) and put a coat of walnut oil on the handle as a finish. I didn’t sink the screw heads yet, and I can feel a couple rough spots that will need to be tweaked, but over all it felt really good in my hand, and it was really nice to start something and finish it in the same night. I feel like I’ve passed some hand tool rite of passage here, and I’ve read a lot of blogs online and sooner or later they all seem to make this step. I was also surprised at how EASY this was. I had been intimidated by the concept, but for some reason tonight it was a simple thing for me. See, rite of passage. It’s a Zen thing I think, once you are at a certain level or something. Anyway, I need to get to bed, but I’m pretty pleased with tonight.